Pope Innocent XI (Latin: Innocentius XI; 16 May 1611 – 12 August 1689), born Benedetto Odescalchi, was Pope from 21 September 1676 to his death in 1689. He is known in Budapest as the "Saviour of Hungary". After a difficult cause for canonization, starting in 1791, which caused considerable controversy over the years and stopping on several occasions, he was beatified with no opposition in 1956 by Pope Pius XII. The birthplace of Benedetto Odescalchi at Como. In 1650, Odescalchi became bishop of Novara, in which capacity he spent all the revenues of his see to relieve the poor and sick in his diocese. With the permission of the pope he resigned as bishop of Novara in favor of his brother Giulio in 1656 and went to Rome. While there he took a prominent part in the consultations of the various congregations of which he was a member. Monument to Pope Innocent XI, St. Peter's Basilica. 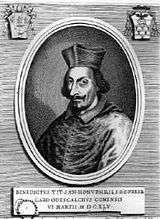 Innocent XI dispatched Ferdinando d'Adda as nuncio to the Kingdom of England, the first representative of the Papacy to go to England for over a century. Even so, the Pope did not approve the imprudent manner in which James II attempted to restore Catholicism in England. He also repeatedly expressed his displeasure at the support which James II gave to the autocratic King Louis XIV in his measures against the Church. It is not surprising, therefore, that Innocent XI had less sympathy for James than for William of Orange  and that he did not afford James help in his hour of trial. In 2007, fictional writers Rita Monaldi and Francesco Sorti, drew popular attention to the claim, repeatedly made by historians over the intervening centuries, that Innocent XI had secretly funded the resistance of the Protestant hero William of Orange to the French King, and even financed his overthrow of James II of England. This was done using the established Odescalchi family business in money-lending. 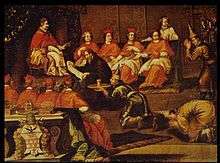 Innocent XI issued the papal bull Sanctissimus Dominus in 1679 to condemn 65 propositions that favored a liberal approach to doctrine which included two that related to abortion. He first condemned proposition 34 and countered that it was unlawful to procure abortion. He also condemned proposition 35 and stated that the fetus does indeed contain a soul and that to abort was murder. Innocent XI was no less intent on preserving the purity of faith and morals among all people. He insisted on thorough education and an exemplary lifestyle for all people and he passed strict rules in relation to the modesty of dress among Roman women. Furthermore, he put an end to the ever increasing passion for gambling by suppressing the gambling houses at Rome. By a decree of 12 February 1679 he encouraged frequent and even daily reception of Holy Communion. On 4 March 1679, he condemned the proposition that "the precept of keeping Holy Days is not obligatory under pain of mortal sin, aside from scandal, if contempt is absent". The document stated that the church taught it was a mortal sin to intentionally skip mass attendance on Sunday or a Holy Day without a legitimate excuse. It further stated that the faithful had to attend the mass on Sunday itself or on the Saturday evening. In 1688, he reiterated a decree of Pope Sixtus V that banned women from singing on stage in all public theatres or opera houses. Statue of Innocent XI in Budapest. Innocent XI's health declined in 1689 and he was confined to his bed since June. He cancelled a consistory of cardinals on 19 June for the examination of bishops due to ill health and did not hold meetings on 21 June. 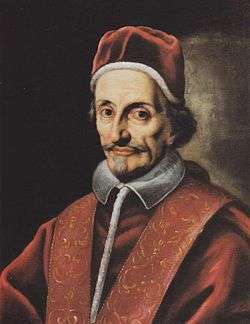 The pope suddenly took ill with a fever on 25 June and on 29 June was unable to celebrate Mass for the Feast of Saints Peter and Paul, thus, had Cardinal Chigi celebrate it in his place. The pope's condition worsened on 2 July and led his doctors to lance his left leg which caused fluid release, eventually having an operation on his right leg on 31 July, and two more in the following two days. 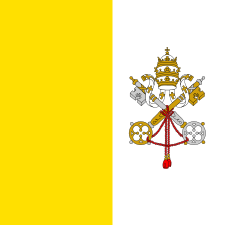 ↑ "August 12 - Blessed Pope Innocent XI (in Italian)". Diocese of Novara. Retrieved 23 March 2015. ↑ "Cardinal Scola in the Cathedral for the closing of the Year of Innocent (in Italian)". Diocese of Como. 8 May 2012. Retrieved 23 March 2015. ↑ Philips, Adrian; Scotchmer, Jo (May 2010). "Budapest: CASTLE HILL". Hungary. Bradt Travel Guides. p. 130. ISBN 978-1-84162-285-9. Retrieved 6 May 2015. 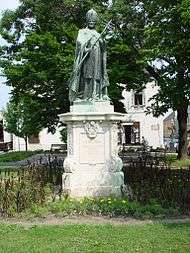 At the square's centre is a statue of Pope Innocent XI, who is known as the 'saviour of Hungary' because of his endeavors in funding the European forces that freed Hungary from Turkish rule. 1 2 "Pope Innocent XI". Catholic Encyclopedia. Retrieved 18 March 2014. ↑ "Pope Innocent XI". Cultural Catholic. Retrieved 18 March 2014. ↑ "Pope Innocent XI". NNDB. Retrieved 18 March 2014. ↑ Crane Brinton, "Italy and the Papacy, 1655 A.D.-1799 A.D." in An Encyclopedia of World History (1941), Boston: Houghton Mifflin. ↑ Moore, Malcolm (20 March 2008). "Vatican forced us out of Italy, claim authors". The Daily Telegraph. London. Retrieved 22 May 2010. 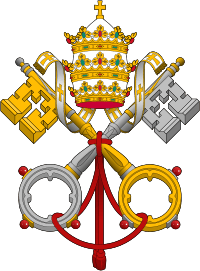 ↑ "Pope Innocent XI (1611-1689)". The Embryo Project Encyclopedia. 18 March 2015. Retrieved 11 April 2015. ↑ "Is it really a mortal sin to skip Sunday Mass?". The New Theological Movement. 21 October 2014. Retrieved 11 April 2015. ↑ "The Castrati-Mutilation in the Name of Religion". Retrieved 11 April 2015. ↑ "Extremely rare book from 17th century, banned by Pope Innocent XI, resurfaces". Catholic Online. 11 April 2015. Retrieved 11 April 2015. 1 2 "Sede Vacante 1689". CSUN. Retrieved 29 December 2015. ↑ Bradshaw's Illustrated Hand-Book to Italy (1865) describes Innocent XI's tomb as being that of his Monument in St Peter's Basilica, which is near that of Pope Leo XI's monument and tomb. Francis Wey's Rome (1875) and S. Russell Forbes' Rambles in Rome: An Archaeological and Historical Guide (1882) also refer to Innocent XI's Monument as being his tomb. ↑ "Monument to Bl. Innocent XI". SaintPetersBasilica.org. Retrieved 21 June 2011. ↑ "Blessed Pope Innocent XI". Catholic News Agency. Retrieved 21 June 2011. 1 2 Kerr, David. 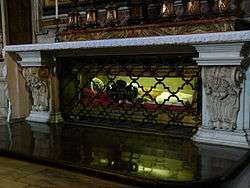 "Pope Innocent XI's remains make way for John Paul II". Catholic News Agency. Retrieved 17 June 2011. ↑ "The return of Imprimatur in Italy: censorship is over?". Cultora. 9 September 2015. Retrieved 27 September 2015. This article incorporates text from a publication now in the public domain: Herbermann, Charles, ed. (1913). 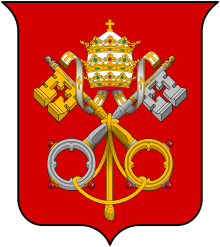 "Pope Innocent XI". Catholic Encyclopedia. New York: Robert Appleton.